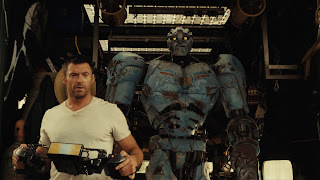 My 12 yo told me yesterday that he wants to go see Real Steel. I've been thinking of letting him see it. He was funny though because he said they probably have a PG-13 because of the fighting and maybe some not so good words. Yep, my boy is growing up. He's starting to understand how movies work. “Like” REAL STEEL on Facebook at http://www.facebook.com/realsteelmovie. Did you see Real Steel over the weekend? If so, what'd did you think? I might have a one on one with Buddy this weekend and take him to see it.